Cuba’s Revolutionary Armed Forces (FAR) have learned to adapt to the changing environment. Since the Soviet Union’s disintegration, the FAR have had to refocus their core mission and reassert their value in the Cuban polity. As a result of the loss of economic aid from the Soviet Union, the FAR have become a constabulary force, a shadow of their former self. Relegated to economic activities to sustain itself as an institutional actor, the FAR face the challenge as defender of the Revolution. As an institutional actor, the FAR have further solidified their standing within the hierarchy of the Cuban regime. The period of purge during the Ochoa affair afforded the FAR the absorption of the Ministry of the Interior (MININT). The MININT was an institutional challenge to the FAR’s reputation and power. This essay will address the evolution and transition of the FAR as an institutional actor, their present domestic mission as contributor to the Cuban economy and their current capabilities and offensive threat. In Communist systems, a party dominant authority structure, a high level of elite integration, and a complex institutional relationship that combines elements of both subordination and autonomy—these are the relatively constant aspects of the party-army relationship (Perlmutter and LeoGrande 1982, 786). In the case of Cuba, the conflict model is representative of the Ochoa affair. Divisions between the MINFAR and the MININT were exacerbated with the alleged corruption trial of Division General Arnaldo Ochoa Sánchez. Ochoa was the most highly decorated military officer in contemporary Cuba; he fought in Angola and led military missions to Ethiopia and Nicaragua. The Ochoa trial was a consequence of the MININT’s increasing independence, the growing discontent of officers who served abroad and the training received by the “perestroika generation” in the Soviet Union (Millet 1993, 5). The de la Guardia brothers, Antonio and Patricio, were intelligence officers of the MININT, whose independent activities were a source of concern for the MINFAR. The activities were a signal of institutional independence, not under the direct control of Raúl Castro or his officers at MINFAR. This created a bitter rivalry within both institutions. If there is an institution that has been demanding in this country, if there is an institution that has set standards, if there has been an institution that has been, par excellence, an educative institution in this country, it has been the FAR (Foreign Broadcast Information Service 1989). The late Enrique Baloyra (1996) astutely observed that “the Ochoa crisis revealed that conflict did not occur neatly along the civil-military divide but, instead, involved rival civil military coalitions. The Ochoa affair also demonstrated that the historic power bloc remained hegemonic within the revolutionary coalition.” The civil-military coalitions that Baloyra describes are observed by the institutional rivalry of the FAR and MININT, where coalitions caused friction. Moreover, the Ochoa trial sent a signal to the officer corps that loyalty was to be expected and independent actions were not to be tolerated. Purging the MININT of disloyal officers and replacing them with those of the FAR loyal to Raúl Castro and Fidel Castro was a move to quell any sort of rebellion within the institutional hierarchy of the armed forces. This “macrofacción” (Alonso 1995a; see also Fuentes 1999 and his to be published book, In the Jaws of the Wolf, for an updated assessment of the Ochoa affair) theory is a plausible thesis in the mindset of the hierarchy, who perceived the threat to their power and that of the institution’s power. The trial and execution of Ochoa seemed more connected with the elimination of a potential rival than with drugs (Suchlicki 1997, 123). Thus, the purging and absorption of the MININT into the FAR nulls to a certain degree the classic theory of conflict within institutions. By neutralizing the internal threat to stability, the hierarchy instinctually halted any further erosion to their control and command of the armed forces. Furthermore, the MININT was formed from the Rebel Army and it would fall under the control of the FAR, assuring that institutional rivalry would cease. As the result of the collapse of the Soviet Union, the chief economic supporter of Cuba and of the Cuban armed forces, Cuba has had to reassess its economic structure. The principal institution that has provided assistance to the government during the “special period” has been the Cuban armed forces. The main objective of the special period measures seems to be preserving the rule of the Cuban government (and the Cuban Communist Party) rather than improving the economic well-being of the Cuban population and/ or developing closer economic ties with the nations of the Hemisphere (Pérez-López 1997, 3). Cuba’s armed forces commenced refocusing their mission to assist the government in its effort to retard the downward spiral of the economy. According to the Banco Nacional de Cuba (1995), “during the crisis the economy faltered, the nation’s budget deficit nearly tripled, rising from 1.4 billion pesos in 1989 to nearly 5.1 billion pesos in 1993.” Thus, the FAR began to take charge of the Cuban economy. Furthermore, the military has extended its involvement into each of the main sectors of that make up Cuba’s socialist economy; namely, the agricultural sector, the productive (including manufacturing) sector and the services sector, which includes the growing tourism industry (Greene-Walker 1996a, 4). Gradually, the FAR took steps to make their presence in the Cuban economy felt. An example of this has been the military industries, which increased production of items for the civilian sector. For example, with a 25 percent increase in the first trimester of 1995, the Military Industries Union demonstrated that it had put its production capabilities into producing for the civilian sector (“Military Industries” 1995). Army Corps General Raúl Castro has stressed the necessity of military intervention in the economy. Particularly in agriculture, the FAR have assisted the civilian sector. An example of this assistance has been the Army of Working Youth (Ejército Juvenil del Trabajo) who are working in the plains and mountains, in sugar cane fields, coffee, citrus fruit and banana plantations, vegetable and potato fields. However, agriculture is not the only area where the FAR are involved. The tourist sector is under the direct control of the Cuban armed forces. The MINFAR has its own Department of Economic Affairs, in which officers are responsible for and govern state enterprises (Aroca 1995). Therefore, the armed forces’ participation in economic activities has been beneficial to the regime as it provides a significant source of revenue from tourism as well as the enrichment of the officer corps, which creates a loyalty to the hierarchy. Jorge Pérez-López best states the benefit of the armed forces economic participation, “[Fidel] Castro has perfected the method of ‘spontaneous privilege’ through which it gives ‘those loyal’ part of the national patrimony” (Alfonso 1999). A comparative example to military participation in the economy can be found in the People’s Republic of China. The People’s Liberation Army (PLA) is heavily involved in the Chinese economy. China’s Commission of Science, Technology, and Industry for National Defense and Defense Industries (COSTIND) is in charge of military research development, testing, and production in the military and defense industries. COSTIND has facilitated civilian commercial deals as well as promoting foreign arms sales (Kan 1996). It is estimated that there are 20,000 PLA companies doing business in everything from pig farms to telecommunications (Sun 1997). The PLA’s participation in the military and civilian economy is an example that Cuba is trying to duplicate in its own set of economic conditions and variables. The size of the FAR began to decrease beginning in 1992. According to The Military Balance (IISS 1992), it was estimated that the FAR’s total forces at that period reached 172,000. Jane’s World Armies in 1996 estimated total troop strength to be at 145,000 (Jane’s Information Group 1996). 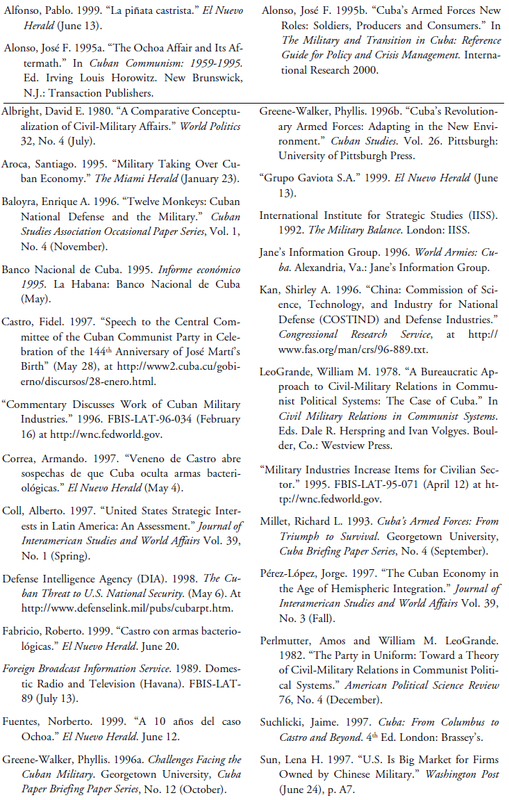 In 1998, the Defense Intelligence Agency (1998) released its review and assessment of the Cuban threat to U.S national security. DIA estimates that the Cuban armed forces number between 50,000 to 65,000 regular troops. The reduction in forces has changed the FAR into a constabulary force, unable to project its reach in foreign countries as it has done before. The FAR have become a defense force limited to operating in their own regional theater, their own shores. With the most absolute conviction we are able to tell the dragon: You cannot ever devour this lamb in spite of your rockets, your airplanes, your so-called intelligent arms, because this lamb is more intelligent than you and this lamb in its blood has and would only have poison for you. This threat is a possible reality in the event of a crisis of power and stability of the regime. Alberto Coll (1997) describes the “Götterdammerung” scenario whereby if Castro ever faced internal revolt and the very possibility of losing power, he might be tempted — drawing on the megalomaniac and Nietzchean elements of his personality — to go out with one final grand gesture, preferably directed against the object of his seemingly implacable hatred: the United States. For instance he might order an air strike against the United States, either using biological weapons (which some intelligence analysts believe Cuba might have) against Miami, or an air attack against South Florida’s nuclear power plant at Turkey Point. Cuba’s armed forces still possesses the capability to create havoc. It remains to be seen that in the event of a threat to the regime, the FAR would be willing to act as an irrational actor by implementing an offensive warfare that would directly threaten U.S. national security and insure a detrimental response. The FAR’s conflict with other political institutions, e.g. the Cuban Communist Party (PCC) and the MININT, is an expected reality within the Cuban political system. The hierarchy recognized the potential threat posed by the institutional independence of the MININT. The challenge to power was quickly dealt with, limiting the potential growth of institutional conflict: by severing the realized threat and substituting the existing personnel with FAR officers loyal to the regime elites, thus neutralizing future instability within the institution. Cuba’s economic crisis or “special period” created a new mission for the FAR. The militarization of the economy created sectors where FAR officers directly control segments of the Cuban economy, e.g., agriculture and tourism, benefiting economically the officer corps. These military enterprises have given wealth to the FAR hierarchy and secured their loyalty to the regime. As a result of the drastic downsizing of the FAR as a consequence of the “special period,” Cuba’s armed forces have become a constabulary force, charged with the domestic guardianship of the Revolution and state. However, the decline of the FAR does not eliminate their potential for engaging in offensive warfare. The potential threat of biological armaments is a serious scenario one should be vigilant of. In conclusion the FAR have evolved from within the purview of institutional conflict and succeeded in asserting command of institutional conflict. They have assisted the Cuban economy, benefiting themselves from it, and proactively dominated sectors producing substantial wealth. Finally, the FAR remain a potent military force domestically able to engage in offensive operations that can potentially pose a serious risk if faced with an external challenge to its governing elites.